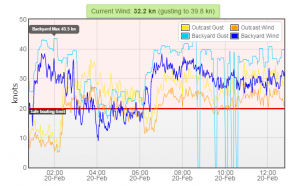 I have overheard about three different people today call the weather “gross”, which is understanding given the winds around here are gusting over 40 knots and it’s been raining all day, but I’m kind of enjoying it. Due to safety concerns, we don’t take our Zodiac boats out if the winds are higher than 20 knots, so Logan and I have been occupying ourselves with indoor tasks today. I thought I’d take the time to share a few photos with you. 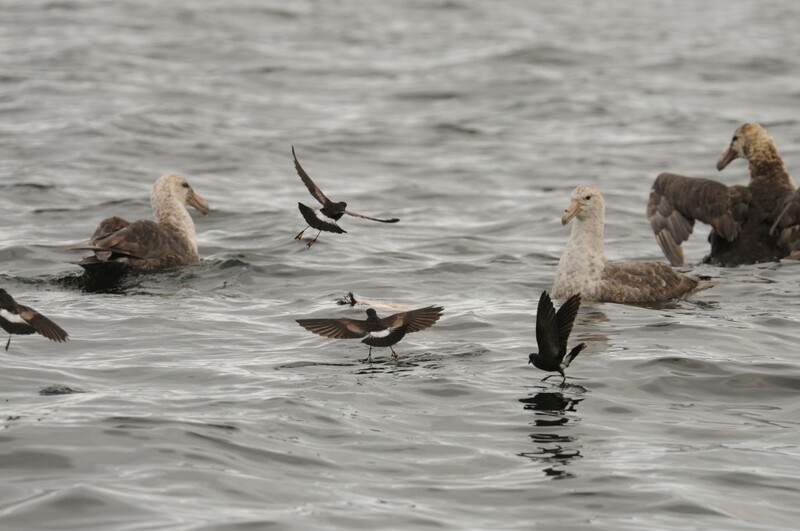 Yesterday while Logan and I were surveying for whales we came across a group of giant petrels sitting on the water along with a few hovering Wilson’s storm petrels. 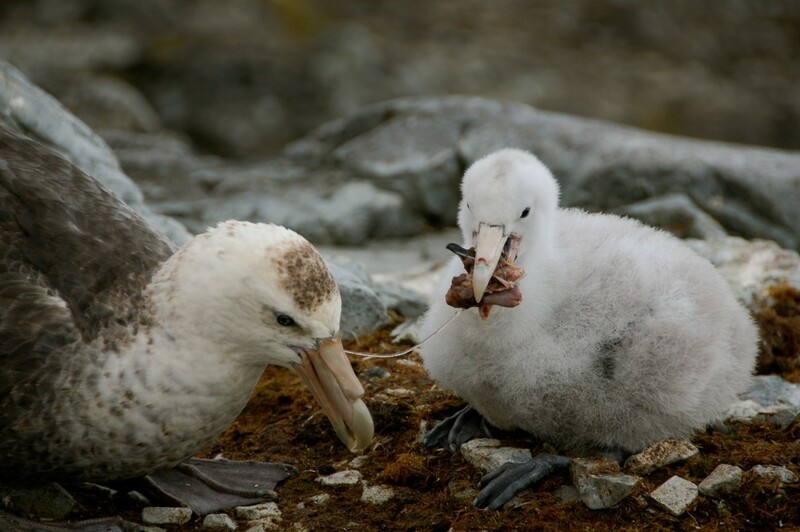 Upon closer inspection we found the petrels scavenging on a fresh penguin carcass. Leopard seal leftovers perhaps? 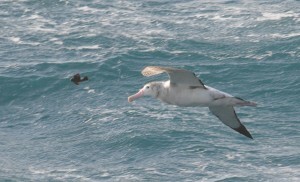 Southern giant petrels are very cool! They range throughout the entire southern ocean and breed on many sub Antarctic islands and along the Antarctic Peninsula. 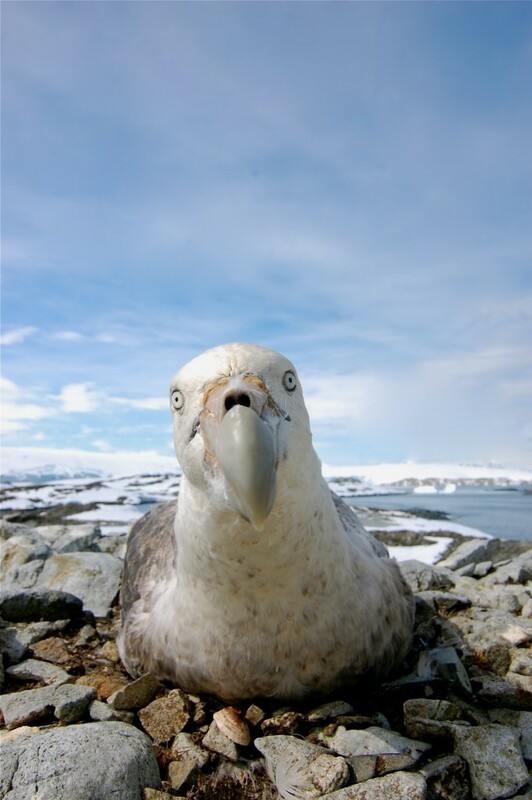 They are large birds, with a wingspan of 150-210 centimeters (over 6 feet!). The scientific name of the giant petrel is Macronectes giganteus, which comes from Latin and Greek root words meaning “large”, “swimmer”, and “gigantic”. 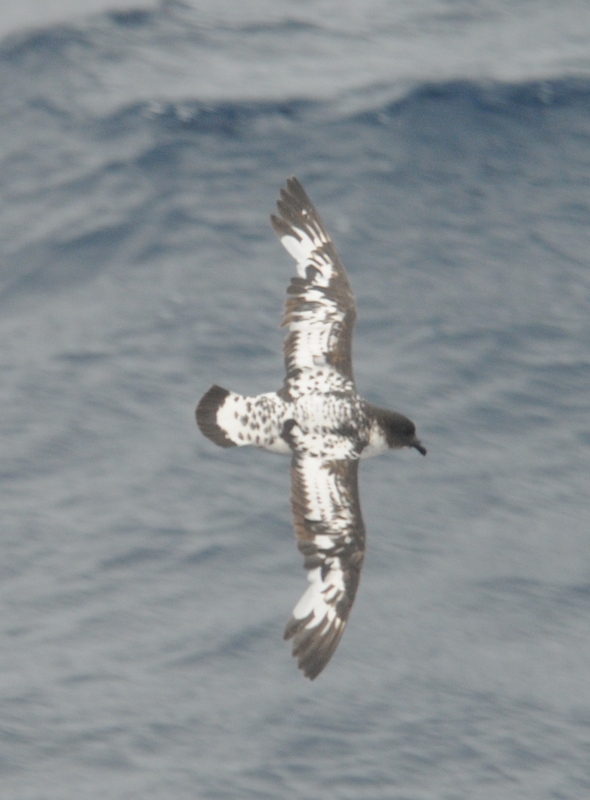 Another fun fact- the name Petrel refers to the story of St. Peter walking on water. 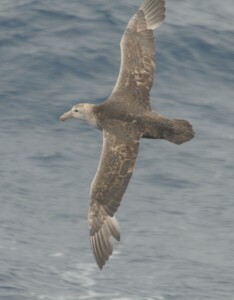 Petrels have webbed feet that allow them to run on the surface of the water when they take off (they also make unique tracks through the snow). 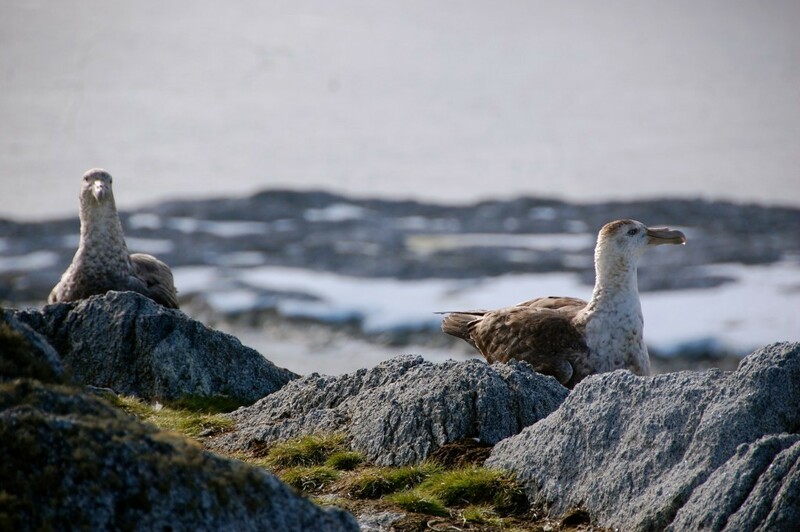 The seabird team here at Palmer is monitoring the local population of giant petrels that are currently raising their chicks on nearby Humble Island. 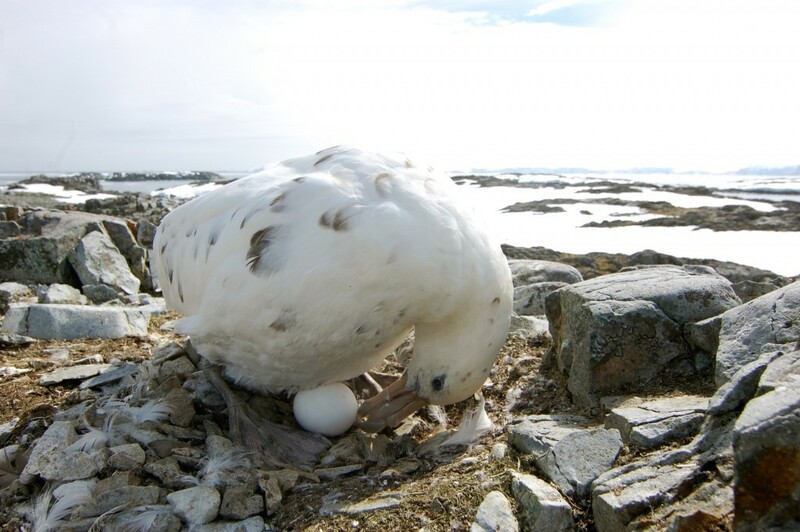 While they are raising chicks, mating pairs take turns guarding their nest and making foraging trips to obtain food for themselves and their young. 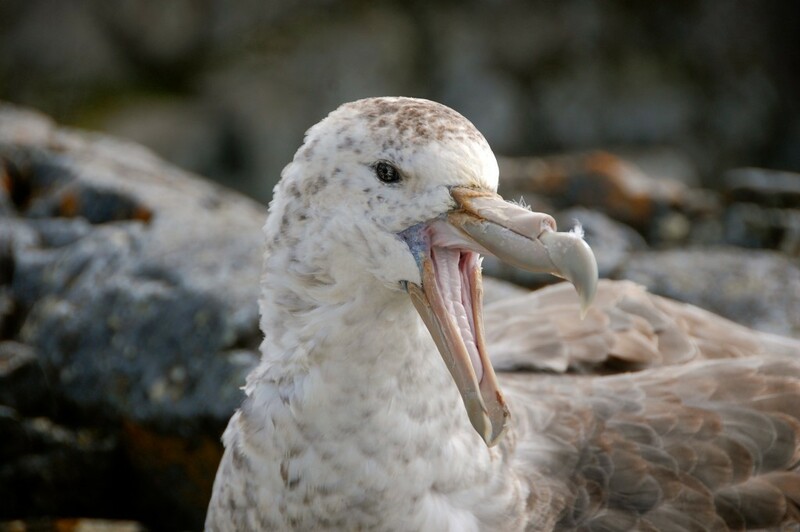 Giant petrels are scavengers and will feed on carrion (e.g. dead and decaying elephant seals) and they are also predators that will kill live birds by taking them off the surface of the water. Check out the photos to see what I’m talking about! 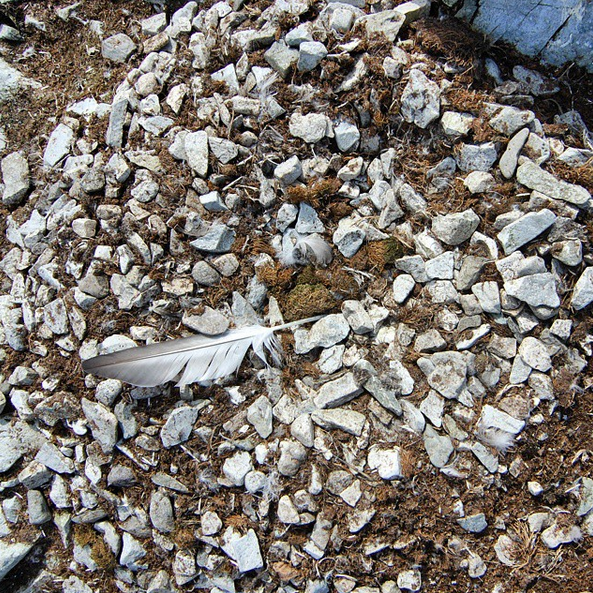 Storm Petrel Central: a gathering of birds above a whale fall? 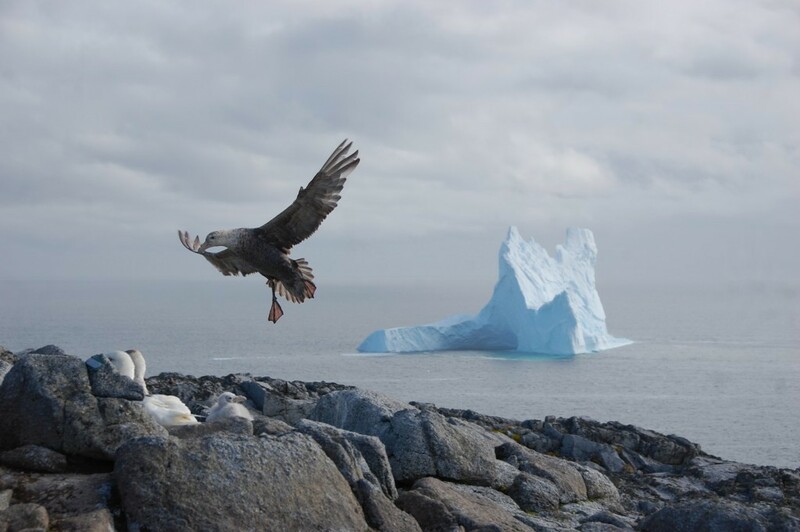 We spend a lot of time on the water, which we really enjoy because we get to see not only the humpback and minke whales we are studying but also all the other wildlife (penguins, seals, flying birds) and this amazing environment around Palmer. 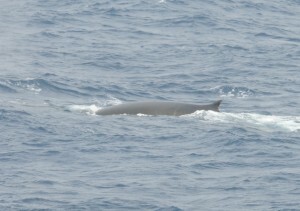 Just in the last two days (while we haven’t seen any whales!) we have seen this area in several different moods – from bright sunshine to cloudy with very cool lighting to a veritable blizzard! 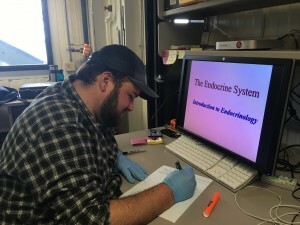 So, while we are doing our surveys for whales and/or krill, we are always on the lookout for animals, ice, or whatever. Sometimes when you’re paying attention, you see things that you may otherwise overlook, and while some of the things you notice turn out to be just a passing bird or seal, sometimes what you notice turns out to be amazing, cool, and interesting. 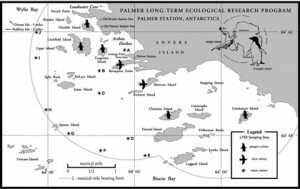 Each and every time Logan and I would pass the corner of Cormorant Island in the southeast corner of the boating area (see the Palmer Station Area map), we would see a small to medium sized grouping of Wilson’s storm petrels, sometimes joined by a few southern giant petrels (GPs). 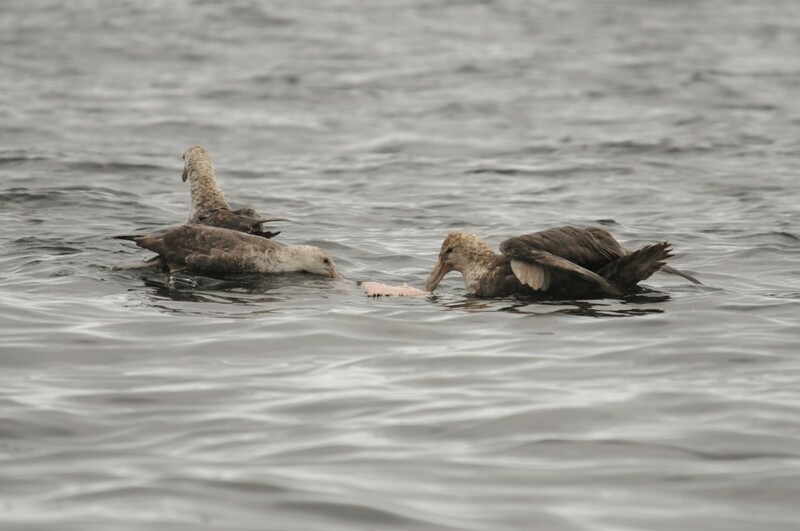 The first time or two I noticed the gathering of petrels, I didn’t think much of it, but then I realized that every time we passed that location (which has been often as we search for these bloody whales! ), the birds were there. 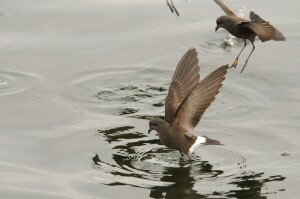 The storm petrels, as they do, would be flitting about and ‘dancing’ on the surface of the water collecting food. 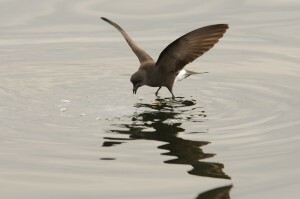 Well, we noticed this phenomenon enough times that we thought there must be something to it, but what could be attracting the petrels to the same spot all the time? 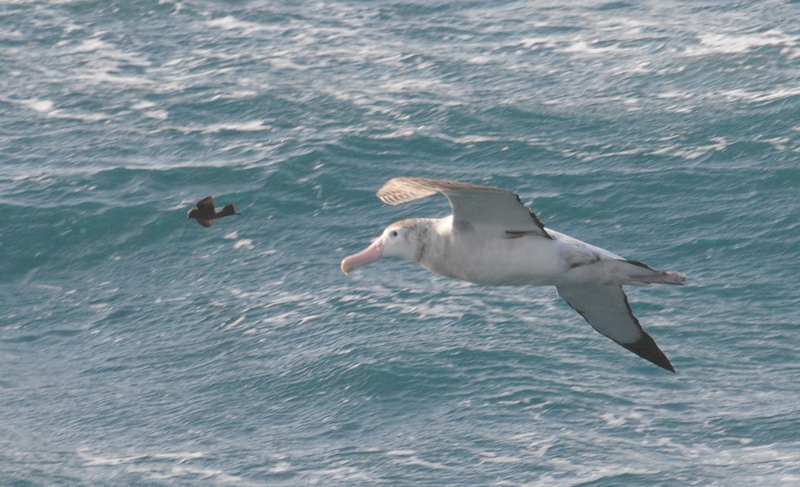 Yesterday we did some echosounder surveys for krill in the area, and we decided to head to ‘storm petrel central’, and if the birds were again in that spot, we would run the echosounders over the area to see if there was a big krill patch. 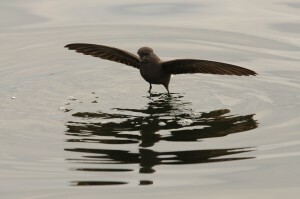 When we arrived, the birds were there as always, probably 20 storm petrels and 4-5 GPs. We approached slowly with the echosounders on and planned to do a couple loops around the spot; the GPs took off, but the storm petrels hardly knew we were there as they kept dancing around on the surface, presumably grabbing food. Well, the echosounders showed nothing in the water column…but, as we glided over the area we noticed two things (in addition to the birds!) at the surface. 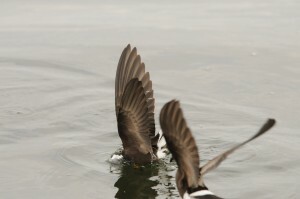 First, we saw small oil droplets coming to and breaking at the surface and quickly dissipating. Second, we smelled a smell that relatively few people in the world have smelled…dead whale!! We stayed for several minutes, while Logan took ~200 photos! And we continued to see little oil droplets and the storm petrels going nuts, with some of them actually diving beneath the surface, which is rare for them, I believe. 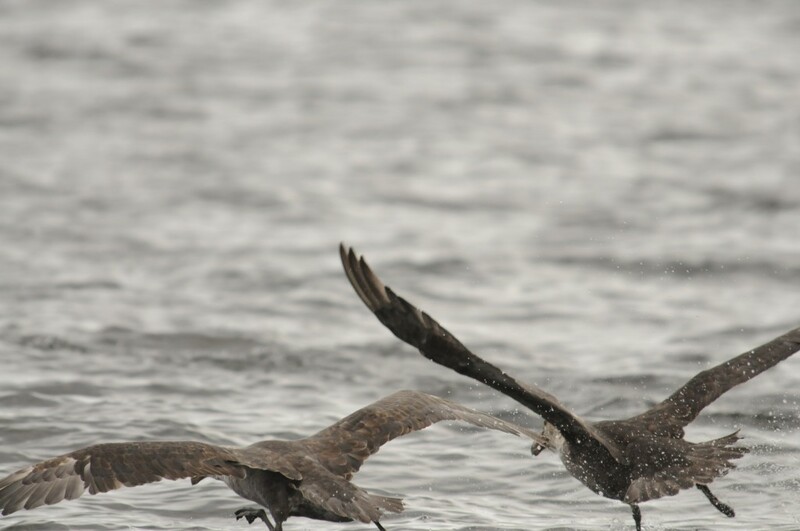 The birds would change locations a bit and dance along the surface 30-40 feet from what seemed to be the center of the action, but the activity was very much centrally located to our spot and our presence did not deter them in the least. Could there be a dead whale at the bottom here? And as it decomposes releasing little tasty bits for the birds? We went back today with the Station doctor after he joined us for some more krill surveys. The birds were most certainly there, maybe even more storm petrels today, and we actually saw some very small white chunks come near the surface and get snatched up by the little ‘butterflies of the sea’, as they are called in French. We also saw a good bit more oil hit the surface, and that unmistakable smell was in full force!! Storm petrel central has been one of those cool experiences we didn’t expect to have, but will be an indelible memory of our work this year. 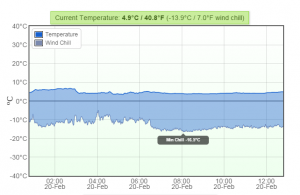 And, who knows, if the Station gets an ROV soon, maybe someone could go have a look at our suspected dead whale! 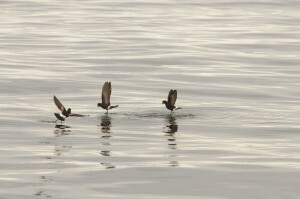 Posted on January 28, 2016 February 16, 2016 Author pallinlTags Doug Nowacek, Palmer LTER, Palmer Station, whale fall, Wilson's storm petrel2 Comments on Storm Petrel Central: a gathering of birds above a whale fall?